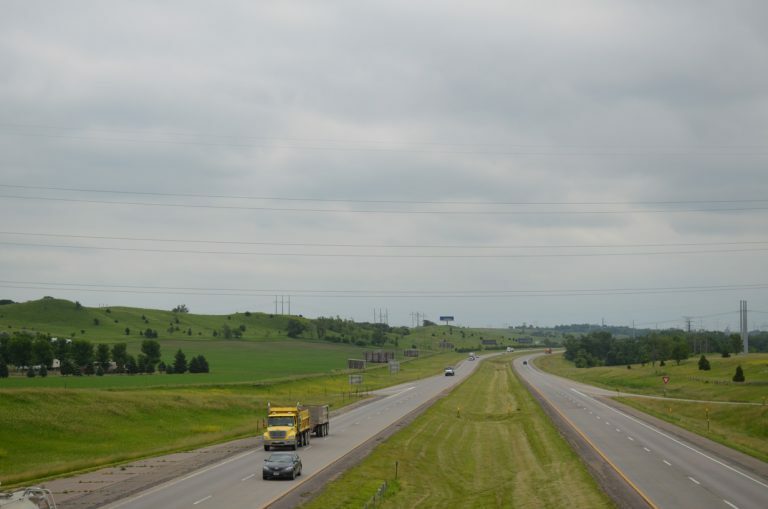 Interstate 90 parallels a transmission corridor, railroad line and the Big Sioux River east from Exit 402. Photo taken 06/17/15. Interstate 90 is the longest Interstate highway in South Dakota, with 412.857 miles through the state. The freeway parallels U.S. 14 from the Wyoming State Line east to Wall via Rapid City; it replaced U.S. 16 from Rapid City east to the Minnesota State Line. Beginning in Seattle, Washington, at the intersection with Washington 519 just west of Interstate 5 in Seattle, Washington, Interstate 90 crosses the country along the northern tier. After passing through Chicago, Interstate 90 follows a series of toll roads and turnpikes east to Logan International Airport in Boston, Massachusetts. For more detail on nationwide Interstate 90, go to the Interstate 90 Guide. This view of Interstate 90 is afforded on the transition ramp from northbound Interstate 190 in Rapid City during the late afternoon. Photo taken 09/03/04. Marion Road south at the folded diamond interchange (Exit 395) with Interstate 90 to the northwest of Sioux Falls. Photo taken 06/17/15. Annexations of Sioux Falls expanded the city limits northwest to include new development by the southwest quadrant of I-29 and I-90. Ramps between the freeway and Marion Road opened to traffic on November 20, 2010.2 Photo taken 06/17/15. Timberline Avenue north at Interstate 90 west (Exit 402). Photo taken 06/17/15. "Interstate Anniversary - To Be Marked In June." Aberdeen American News (SD), May 14, 2006. "I-90 & Marion Road Interchange Opening." South Dakota DOT, press release. November 19, 2010. "Exit 52 reconstruction to begin in March." South Dakota DOT, press release. February 15, 2008. "Exit 52 at Black Hawk to open." South Dakota DOT, press release. January 30, 2009. Schwartze, Brad: email: "Some Notes on South Dakota Roads That You've Visited Last Year," July 11, 2008.